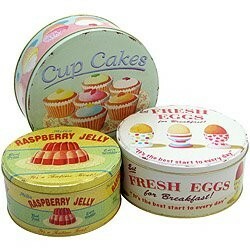 Beautiful Retro Cake Tins! This awesome set of three tins features three different designs for each tin. The small cake tin comes in a yellow and green Raspberry Jelly design, the medium cake tin in a white Fresh Eggs design and the large tin in a mint Fairy Cake design. When stacked inside each other the tins measure 10cms x 19cms x22.5cms. Other products in this range are available including Coffee Break Retro Coasters and Coffee Break Retro Tray.